Zurich, Switzerland, May 10, 2015 – From the shores of the Bosphorus to the banks of the Limmat (or, to be more precise, the Sihl) Eczacibasi VitrA Istanbul have come a long way. If not in distance, from the fringes of Europe to the heart of Switzerland, than surely in achievement. The Turkish team had a perfect ending to a dream season. 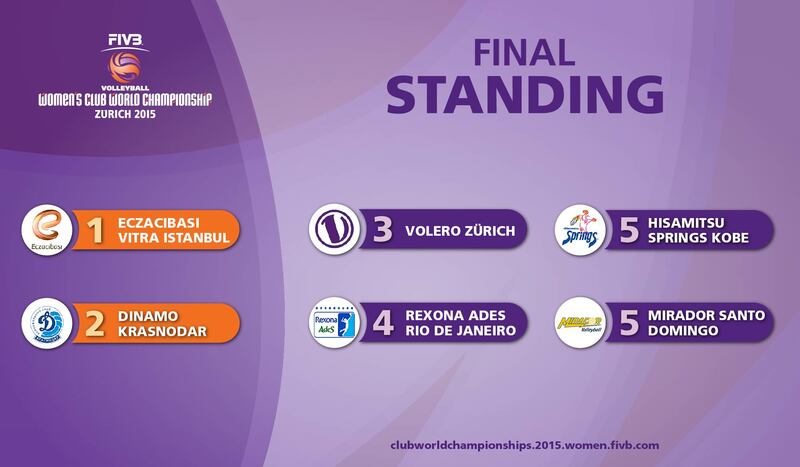 After clinching the CEV Denizbank Championships in Poland to be crowned European champions last month and despite faltering at the national league playoffs, they pulled off a brilliant feat in Zurich to claim the most coveted trophy of them all – that of the FIVB Volleyball Women’s Club World Championship Zurich 2015. And they did this in the most convincing manner, defeating Dinamo Krasnodar 3-1 (25-16, 25-21, 24-26, 25-19) in the final, to become the third Turkish team to claim the club world title. Eczacibasi followed in the footsteps of their cross-town rivals Fenerbahce (2010 in Doha) and Vakifbank (2013 in Zurich) as they blocked their way to victory. Dinamo simply couldn't find around and certainly not over the Turkish block, which contributed as many as 15 points to Eczacibasi's tally. It could even have been easier, had Eczacibasi capitalised on two match points at 24-22 in the third set. With Tatiana Kosheleva effectively neutralised, Cuban-born Rosir Kalderon came on and temporarily gave some solutions to Dinamo's offence. It was not to be, though. Kalderon couldn't last and Ecazacibasi ragained control to bring the game home in four. 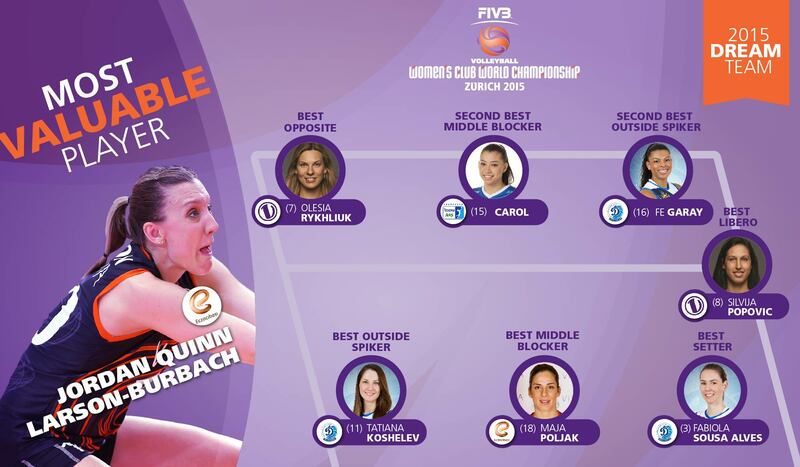 USA's Jordan Larson-Burbach emerged top scorer of the final, with a total of 20 points (3 aces, 15/36 kills and 2 stuffs) to add the World Club title and MVP of the tournament to that of national team World Championship from last year in Milan. Eczacibasi had started off with a shock defeat on the opening day to Hisamitsu Springs Kobe, but they pulled together to improve their performance drastically and continued with critical wins in the remainder of the competition. It was a similar case for runners-up Dinamo Krasnodar, who also faltered in their opening match before picking up to squeeze through to the semifinals and then eliminate Rexona-AdeS Rio de Janeiro for a spot in the grand final itself. Finalists Dinamo would obviously be disappointed not to go home with the gold medal, especially after their great performance in the semifinals. But they too have a come a long, way from the banks of the Kuban. In a parallel course to Eczacibasi’s, they too won a European title by claiming the CEV Cup, then faltered in the national league playoffs, finishing fifth in Russia. But their appearance in the final at Zurich 2015 is testimony enough to their huge progress. It was also a happy occasion for the hosts, Volero Zurich, who did away with Rexona-AdeS Rio de Janeiro 3-0 (25-21, 25-17, 25-18) in the bronze medal match to finally make it onto the podium after two failed attempts. Volero seemed not to rely so much on top scorer Olesia Rykhliuk (17 points), as setter Courtney Thompson spread the play around a bit this time to include more of Dobriana Rabadzhieva, Rachel Sanchez, Natalia Mammadova and even Nadja Ninkovic. Nevertheless, Volero's opposite Rykhliuk has written her own little bit of volleyball history. Midway through the second set, with a block-out from the outside, she tied the all-time scoring record of 85 points held by Dinamo Kazan's Ekaterina Gamova from 2014. And a little later on she smashed the record with her 86th point in the tournament, an ace on end line. The 28-year-old Ukrainian went on to finish the tournament with a total of 93 points. For Rexona-AdeS, the motivation seemed to not be there. The Rio team, clearly disappointed from their semifinal loss to Dinamo Krasnodar, made a half-hearted attempt to get in the game in the third set, but it still felt as if they weren't totally there. This was the last appearance of Rexona-AdeS setter and captain Fofao, who retired at 45, after an amazing career that spans three decades and five Olympics (including gold in 2008 in Beijing).